Please take the time to listen to these. Mark Dever has a good series on evangelism. I’d especially be interested in your thoughts on the last twenty minutes of Evangelism for the Pastor or Preacher. The modern model often looks like this: instead of us making you a skilled fisher of men, we will simply encourage you to invite people to church and then we will close the deal. You bring them and we will close them. 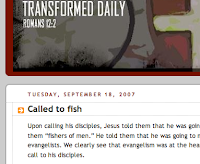 So, instead of making skilled fisherman, churches are using their congregations as lures. This young man gave expression to the second reason many Christians hesitate to talk about Jesus with others. In our postmodern culture, we have the freedom to believe just about anything. You can believe that wearing a crystal will give you inner peace, or that you receive guidance from the spirit of Barbie, and that’s fine. But try to get others to accept your beliefs? Now that’s a different story. That’s perceived as arrogant, politically-incorrect, and downright obnoxious. And who wants to be any of these things? So, many of us hide our faith in Christ because we don’t want to offend. 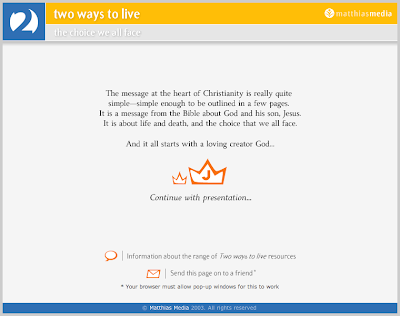 If you go to the actual site there are all sorts of other resources. It is recommended here by DA Carson and Mark Dever. Perhaps you’ve heard of this. But I want to get the word out on this conference. Saylorville is putting on a conference aimed at helping local churches connect the gospel into every area of their ministry philosophy. 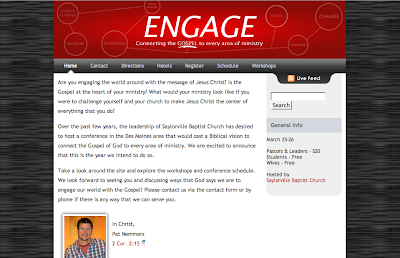 Saylorville is a leader within fundamenalism in purposefully reaching its community with the gospel. The whole climate of the church is one that fosters an evangelistic fervor. I think any church leader would benefit from this conference. Register at our website.